As strange as it may seem, the “story” behind the birth of my first novel, TRISOMY XXI, is one to behold by most people. Weirdly enough, it was only after I was rear-ended by a speeding drunk driver and suffered a closed-head injury several years ago that I developed a newfound passion for creative writing (a true story, even though it sounds like a spooky plot for a Stephen King horror novel). Immediately after the devastating accident, which totaled my car and landed me in the hospital emergency room, I suffered from memory loss and aphasia, resulting in problems with expressing my speech and communicating with others. After numerous visits to a neurologist and months of taking medication used by patients afflicted with Alzheimer’s Disease, my injured brain slowly began to mend itself. When the damage to my brain finally healed though, I noticed something very different in my thought patterns. Now, I had this overwhelming urge, this compulsive desire to put on paper a story that had formed de novo in my mind. I can’t explain it, but my thoughts were now primarily focused on writing this tale of horror. That’s how TRISOMY XXI was born. One could only surmise that the damaged neurons in my frontal cortex had rearranged themselves into a different pattern, thereby enhancing the creative elements of my brain. God only knows. . .stranger things have happened! The definition of a savant is “a person who does not have normal intelligence but who has very unusual mental abilities that other people do not have.” Savant syndrome is “a condition in which a person with a mental disability, such as an autism spectrum disorder, demonstrates profound and prodigious capacities or abilities far in excess of what would be considered normal.” I know that I don’t have savant syndrome, because I'm not autistic, and my IQ has been measured at 161 (unbelievably, Albert Einstein’s IQ was estimated to be only 160, which is amusing to me considering his high level of genius—some speculate that he may have had Asperger’s Syndrome). Another form of savant, known as acquired savant syndrome, is attributed to “a person who acquires prodigious capabilities or skills following dementia, a head injury or severe blow to the head, or other disturbance.” According to medical studies, acquired savant syndrome is an extremely rare condition, affecting very few people in the world. I don't know for sure if I have acquired savant syndrome, but something definitely bolstered my creative writing skills, which appear to have occurred as a direct result of my brain injury and resultant healing process. Whatever did happen to me, I consider it to be a gift, and as long as I can retain this newfound ability, I will continue to write—especially since I do have a passion for it. From my earliest recollections as a young child, I have always loved the genres of horror and science fiction, so that's probably where TRISOMY XXI was spawned—from the deepest reaches of my inner mind. As a result of my savant-like experience, I am now able to pen novels in a freestyle fashion, almost in a stream of consciousness, relying on no outlines, formats, or templates for any assistance. Fortunately, the narrative is able to flow freely from my vivid imagination, ending up with a thrilling storyline that contains an ordered sequence of events. 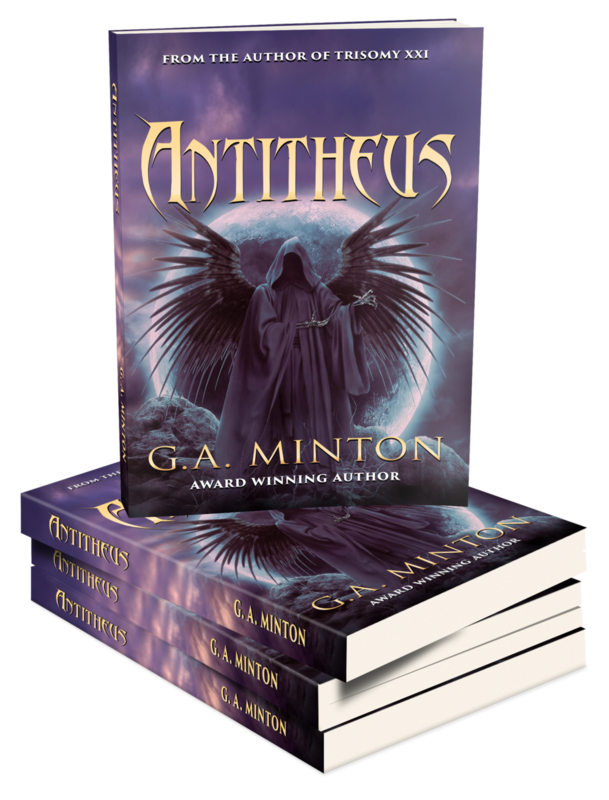 I recently completed my second novel, ANTITHEUS, a dark, supernatural tale of horror that takes Good versus Evil to a whole new level. Currently, my neurons are busy at work processing a third manuscript, a horrifying mystery involving the macabre, which like my other books, contains an O. Henry or Rod Serling surprise ending that would baffle even the likes of the great sleuth himself, Sherlock Holmes! G.A. Minton is married, and lives in Texas with his wife, a son and daughter, and two Bengal cats named Phinneas and Shamus. He is now referred to as “the savant horror writer” by many of his friends. TWO OF MY MANY NON-HUMAN FANS ENJOYING THE HORRORS OF TRISOMY XXI!